Home » News » What is Infinity Gauntlet in Avengers? What is Infinity Gauntlet in Avengers? Marvel universe has lots of powerfull artifacts. Cosmic Cube or Infinity stones are the only tips of the iceberg. But what is Infinity Gauntlet in Avengers, which is worn by Mad Titan Thanos? On April 27th Avengers Infinity War will debut in cinemas. Already known group of superheroes will have to face their biggest threat ever – Thanos. And if you remember, this alien from the movie trailer, he comes to earth with huge, mysterious golden gauntlet with empty six places for infinity stones. This is actualy Infinity Gauntlet with help which its owner will possess incredible strenght and power leting him interfere in reality and modify it for its own need. Infinity Gauntlet was originally created by Mad Titan Thanos who wanted to possess power. In movie universe, Thanos went to Nidavellir, Asgardian forge, where he force gnomes to create gauntlet that will hold a power of the stones. The original intention of the gauntlet was to help take advantage of infinity stones. Owner of the stones will likely have a possibility to change the whole universe and destroy it. Both, in comic and movie Marvel universe, Infinity Gauntlet is one of most powerful artifacts. It has been done purely from gold which accents its power and magnitude. 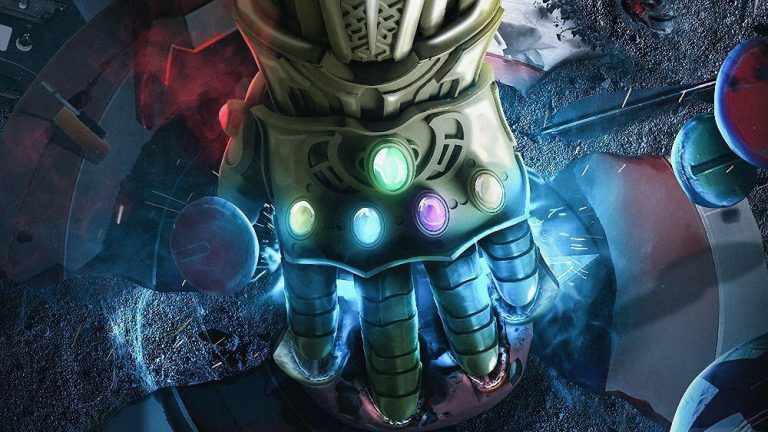 In movie universe, Infinity Gauntlet was used for the first time by Thanos. But it was already seen before in replica form. In Thor: Ragnarok we have seen in Asgard Archives with this difference that it was the right-hand gauntlet. The left one is already in use of Thanos. Who used the Infinity Gauntlet? Infinity Gauntlet history goes back to the 70′. From that time there was issued lots of comics books in which Thanos wasn’t the only one who possesses the gauntlet. There are lots of heroes who were wearing this powerful artifact like Iron Man, Captain America, Black Panther, Spider-Man, Silver Surfer and lots more. You can check below, who has it already on own hand. Trivia: Iron Man was the first hero who had Infinity Gauntlet after Thanos and who could use it.